President Larry Dietz addressed a crowd of more than 400 alumni, donors, and friends in Redbird Arena Saturday night to announce an ambitious effort to ensure success for Redbirds now and in the future. 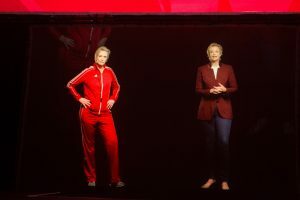 Dietz was joined by famous alumni Jane Lynch, Sean Hayes, and Gary Cole who appeared via hologram throughout the evening. “While we have much to celebrate, there is more that we can do—and should. We have high standards and aspirations for what we can yet achieve at Illinois State. 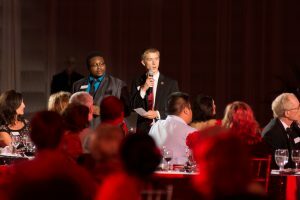 But to accomplish our vision, we need the philanthropic partnership of our Redbird alumni and friends,” Dietz said. 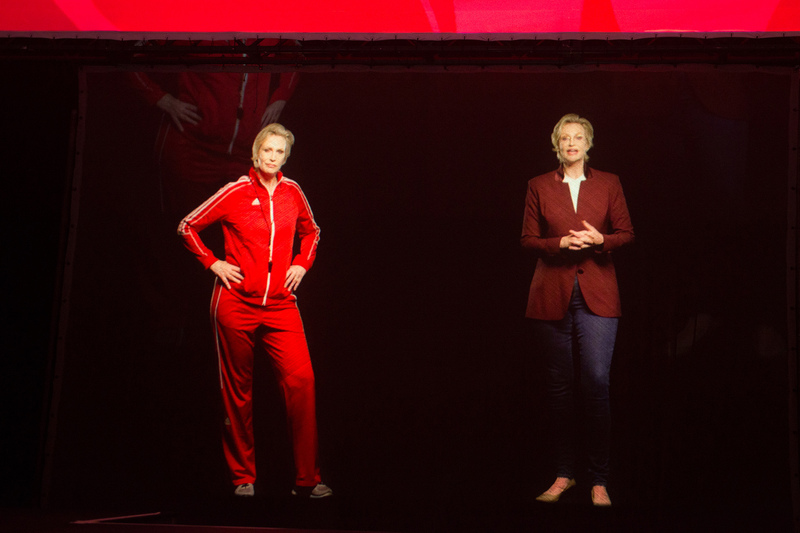 Jane Lynch ’82 appeared as a hologram on stage alongside a hologram version “Sue Sylvester,” Lynch’s character from Glee. That vision led university leaders to create Redbirds Rising: The Campaign for Illinois State. The $150 million fundraising campaign is the most ambitious in our history, enabling the University to achieve three crucial outcomes: supporting student and faculty scholarship, educating globally aware and socially engaged leaders, and sparking continuous creativity and innovation. Thanks to a foundation strengthened by decades of strong leadership and passionate alumni, Illinois State has thrived in a challenging environment. This position of strength encouraged the University to launch the “quiet phase” of the campaign in July 2013. During that time the top 100 public university set three consecutive records for freshman enrollment while achieving top 10 percent graduation and retention rates. Concurrent with this success, Illinois State University consistently achieved record fundraising. Vice President of University Advancement Pat Vickerman announced that more than $103 million had already been committed to Redbirds Rising, leaving $47 million needed to reach the $150 million mark by June 2020. The event presented an opportunity to recognize pace-setting gifts that provided a substantial boost to campaign totals and will impact every corner of campus. 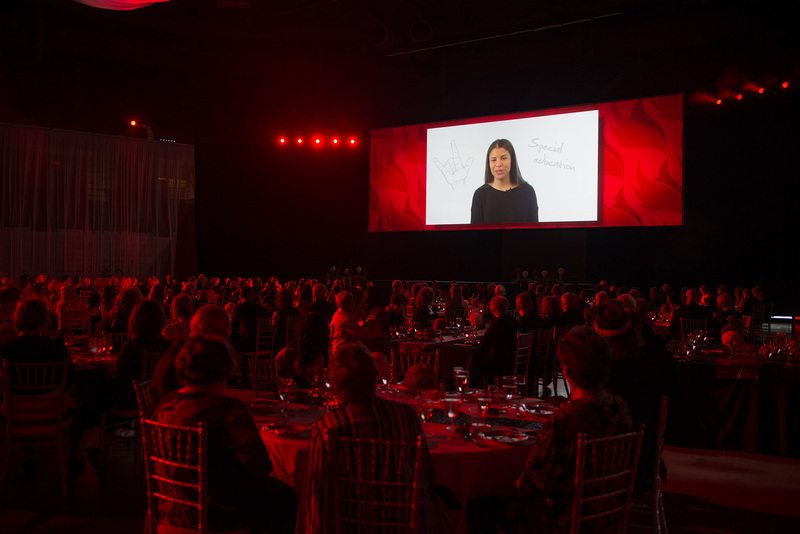 These visionary gifts have taken philanthropy to even higher levels and significantly enhance the Illinois State educational experience. With the launch of Redbirds Rising, the University is now turning to more Redbirds to support their areas of interest. Donors can choose to support their passion at Illinois State and all gifts, regardless of allocation, will move Redbirds Rising closer to the campaign goal. Student Connie Hoekstra talks about the important role scholarships play in her ability to attend Illinois State. “I ask you now to imagine the role you will play in ISU’s future as we raise the level of scholarship, leadership, and innovation throughout our university,” Vickerman said. Every indication shows an enthusiastic base of alumni and friends ready to rise to the challenge. While many universities are experiencing a drop in alumni donor participation, that number is on the rise at Illinois State. The number of alumni donors has increased over the past several years with over 25,000 alumni making a gift to the campaign. Video introducing the Scholarship Rising pillar. Money raised through Redbirds Rising is not intended to replace state support. Instead, philanthropic dollars provide a margin of excellence that enables Illinois State to support three campaign pillars: Scholarship Rising, Leadership Rising, and Innovation Rising. Each pillar was introduced and expounded upon by guest speakers Saturday during the campaign kickoff. Scholarship Rising targets priorities that center on student and faculty support and was introduced by a hologram video of Emmy award-winning actor Sean Hayes. “Through the support of scholarship we can provide unprecedented access to an ISU education and advance scholarly pursuits that help future Redbirds make their dreams a reality,” Hayes said. Connie Hoekstra, a sophomore special education major, shared her story. Hoekstra was diagnosed with Hodgkin lymphoma days before she had planned to depart for college on the East Coast. Her college plans were delayed as she underwent months of chemotherapy. During that time Hoekstra visited her brother at Illinois State and was attracted to the intimate feel of the campus. She changed her mind and applied to Illinois State for the following fall. 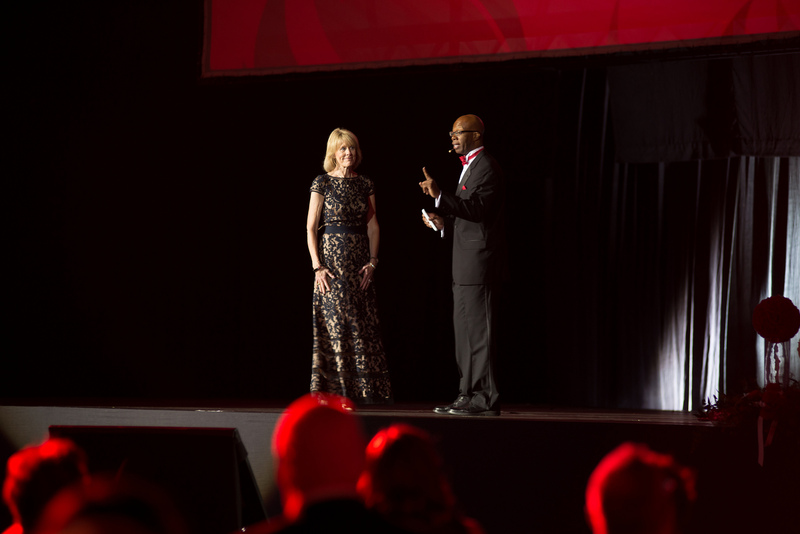 Vice Presidents Jan Murphy and Levester Johnson introduce Leadership Rising. Leadership Rising will advance programs that help students learn to be innovative problem-solvers, which facilitate civic engagement and develop leadership. Opportunities include increased participation in leadership programs, off-campus internships, diversity initiatives, career development, and service-learning projects. Students Isaac Dallas and Christopher Davis share how innovation at ISU has helped them launch a business. Innovation Rising is designed to prepare our students to be innovators in their fields. Veep star Gary Cole also joined the evening via hologram to introduce academic stars that are already benefiting from creative workspaces and innovative technology. 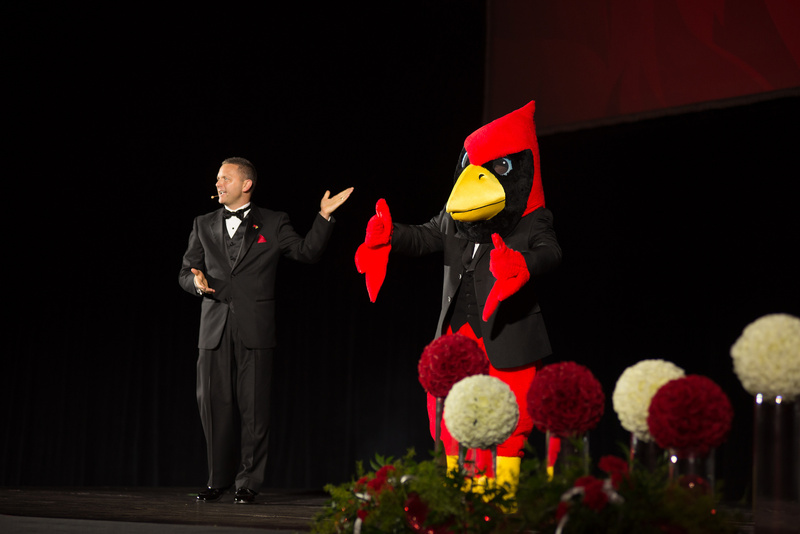 Vice President of University Advancement Pat Vickerman on stage with Reggie Redbird. Other students and faculty joined Munoz and Hildebrandt in sharing specific examples of how their academic area is using innovative technologies and partnerships to solve real-world problems. In the 160 years since its founding as Illinois’ first public university, there have been leaders and initiatives that advanced Illinois State University to a new height of excellence. Campaign co-chairs Jim ’74 and Carole ’75 Mounier, and Dan ’70 and Pam Kelley. 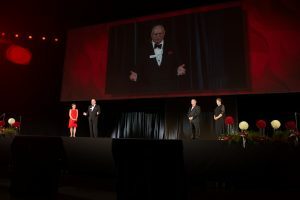 Before the close of Saturday’s event, Dietz urged Redbirds across the nation to rise to the challenge. “I invite you to join with others to reflect on your own Redbird experience and consider ways in which you can help future Redbirds pursue their dreams and aspirations,” Dietz said. To learn more about how you can get involved with Redbirds Rising, visit RedbirdsRising.IllinoisState.edu or call (309) 438-8184. Follow Facebook.com/ISUGiving for campaign news and stories of impact. Click here for more photos from the campaign kickoff.